A mystery this – the first edition has no such section. 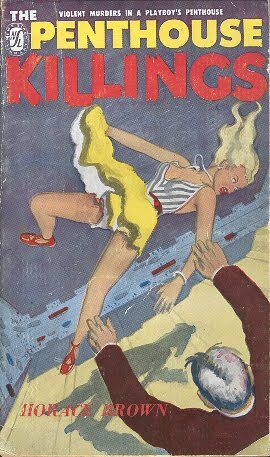 The first English edition, published in 1960 by Secker & Warburg, with Elizabeth Lucy falling to her death. 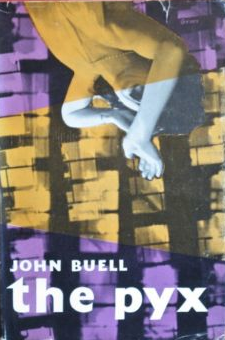 Published in 1973, the first Popular Library edition draws on the movie poster. 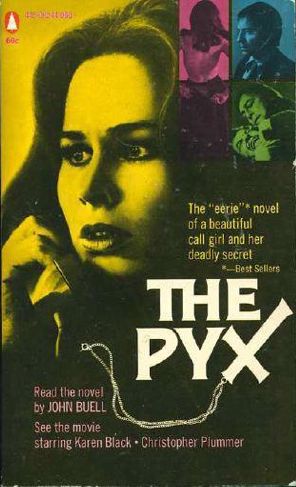 Karen Black makes a phone call, yes, but it's hardly crucial to the plot. 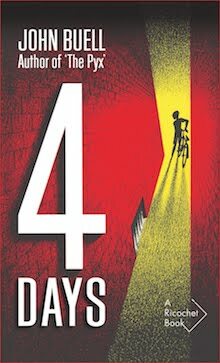 "The 'eerie' novel of a beautiful call girl and her deadly secret", says Best Sellers? Well, not really. Look closely and you'll see that what's quoted is nothing more than the word "eerie". 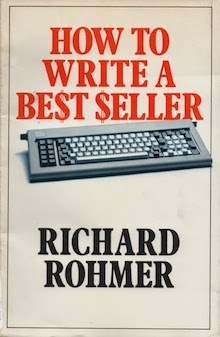 This later Popular Library edition holds keeps the one-word Best Sellers quote, while discarding Karen Black. What do we have instead? A semi-reptilian eye and a wholly-naked body, neither of which feature in the novel. By the way, Elizabeth Lucy is a redhead. 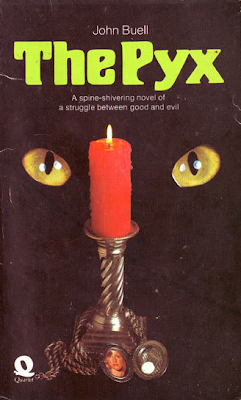 Quartet's 1974 edition introduces a cat – again, not in the novel – and replaces the pyx with a tiny locket containing a girl's photo and what appears to be an aspirin. The only Canadian edition, published in 1991 by HarperCollins Canada. 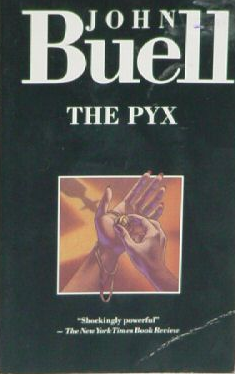 The novel has been out of print ever since. James Gay (1810-1891) was a gunsmith, a locksmith, a carpenter and an innkeeper; but more than all these he was, in his own words, “Poet Laureate of Canada and Master of All Poets.” The man was never properly recognized by his countrymen, or by his fellow poets; his first book, the self-published Poems by James Gay, Poet Laureate of Canada, Master of All Poets (c.1882) has vanished without a trace. 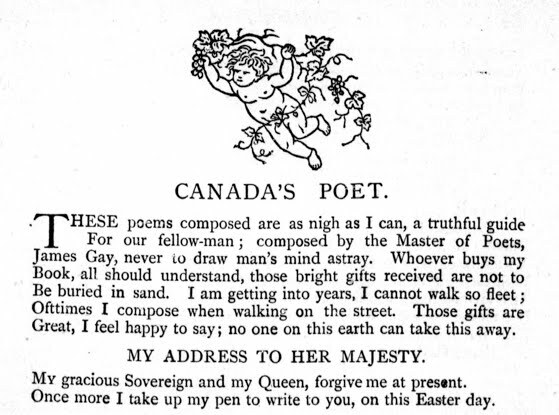 What little recognition he received came from the English house of Field & Tuer, which in 1884 published Canada's Poet. 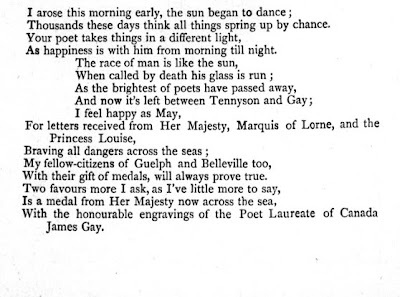 Gay's second and final book, it exists as the happy result of a misunderstanding: the publisher requested Poems by James Gay..., but instead received "a batch of original manuscript for publication". 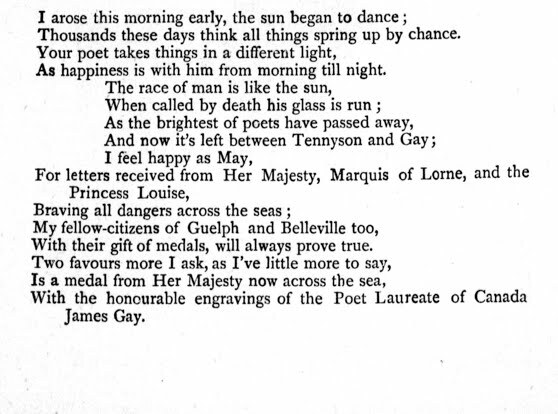 Gay dedicated Canada's Poet to Alfred, Lord Tennyson. "Dear Sir," he begins, "Now Longfellow is gone there are only two of us left." 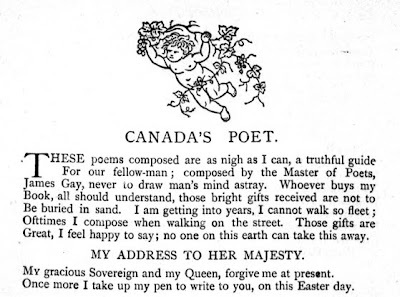 It's a sad observation, one the Master of All Poets (as merely the "Master of Poets") repeats with this undated – and, it appears, unanswered – address to his queen. 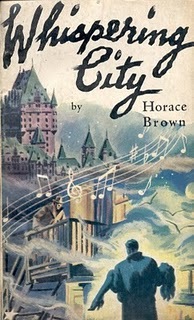 The first book to appear under his own name, Horace Brown's Whispering City is the rarest of things: a novelization of a Canadian feature film. The movie itself has shriveled to a footnote today, but in 1947, the year of its release, it was a very big deal. Shot twice – once in French, once in English – for a few months it looked to be the first fruit of a vibrant post-war Canadian film industry. Of course, all died on the vine. I expect the reason had much to do with money, though I blame Jack Valenti. Whispering City is a pretty good little movie, a fine example film noir. 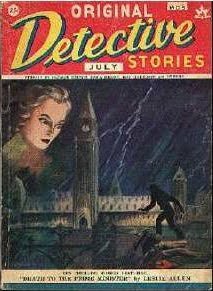 Set in Quebec City, predating Hitchcock's I Confess by some seven years, it tells the story of pretty Mary Roberts, an intrepid lady reporter who gets caught up in a decades-old murder. Corruption, madness, suicide... it's all good fun, though the ending is so rushed that you'd almost think director Fyodor Otsep was counting each frame before he ran out of film. Globe and Mail film critic Roly Young was amongst the greatest champions of Whispering City, giving the movie four stars (just half a star less than La Forteresse, the French-language version). 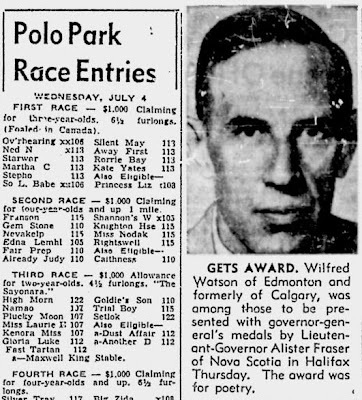 It was, he wrote, "first-rate motion picture fare, and a pleasant augury for the future of Canadian-made films." Just how closely Horace Brown sticks to the screenplay, how adept an adaptor he was, I cannot say. 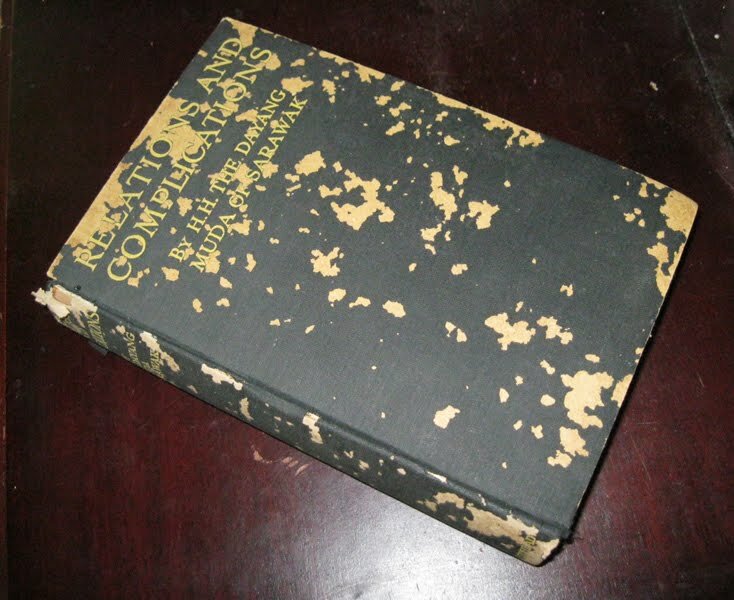 I've not read his Whispering City, and know of only two extant copies: one held by the University of Calgary's Special Collections, the other belonging to bowdler of Fly-by-night (who kindly provided the image above). 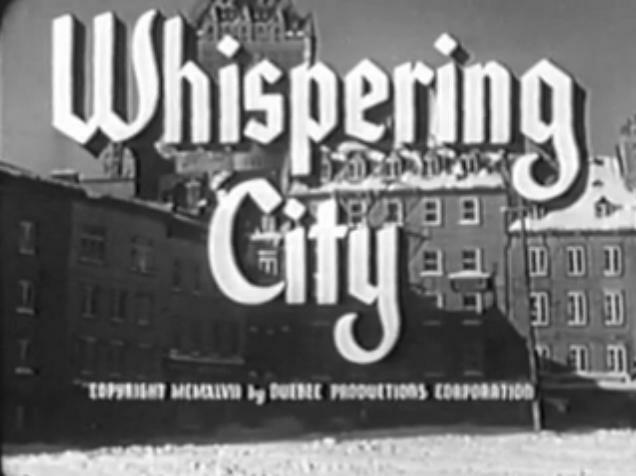 Whispering City was the only original title produced Brown's own Global Publishing Company, a short-lived venture that produced a handful of movie tie-in editions (like Great Expectations and Henry V) and the two-issue Original Detective Stories. I don't see that the Globe and Mail or anyone else paid much attention to Brown's novels. 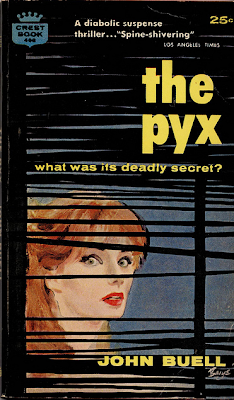 I'm inclined to believe that more has been written this past week here and at Fly-by-night – and, by remarkable coincidence, at Mystery File – than has appeared in the last sixty-five years. Is it time more attention was paid? Don't think so, but I will raise my glass to a hardworking man, a writer who left behind a number of CanLit curiosities. Horace Brown: Fritzi in Flight or a Coincidence? "Who is going to notice the bloodstains on the material, unless looking for it. If they are noticed, what will they be? Ordinary stains to be removed by dry-cleaning. If the blood comes off in the water or cleaning fluid, it is simply the dye running." 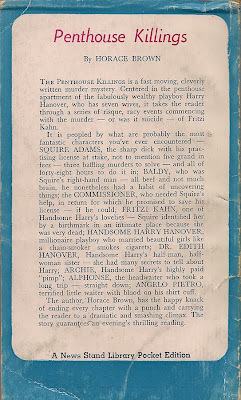 As I say, there were no more Squire Adams mysteries. 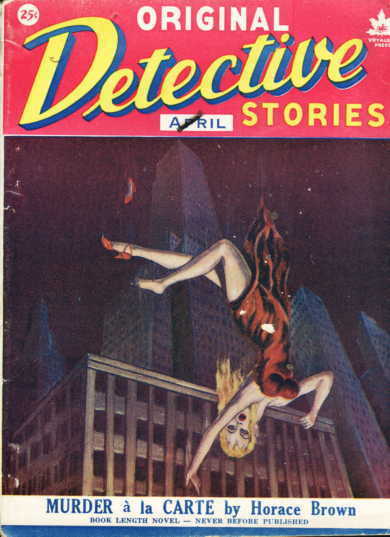 Original Detective Stories was a short-lived magazine from Brown's own Global Publishing Company, located in the media centre known as Pickering, Ontario. The second and final issue featured "Death to the Prime Minister" by Leslie Allen, one of Brown's pseudonyms. 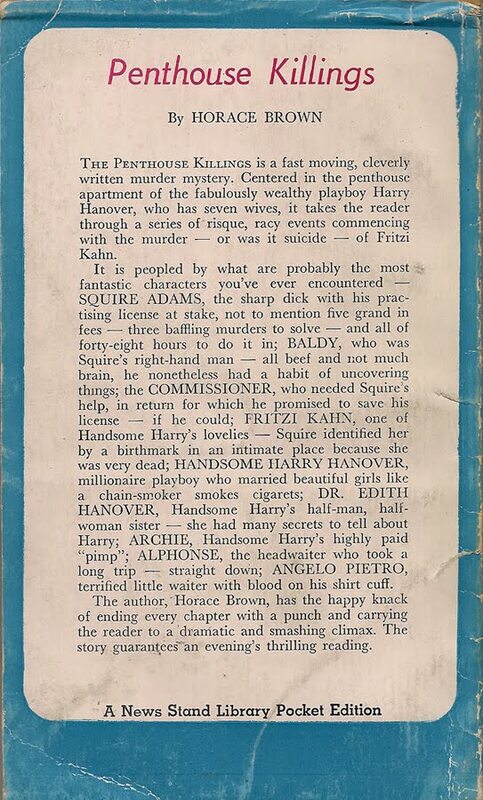 Over at Fly-by-night, bowdler has posted a piece on Murder in the Rough, a short "FULL-LENGTH MYSTERY NOVEL" that was also published under the nom de plume. 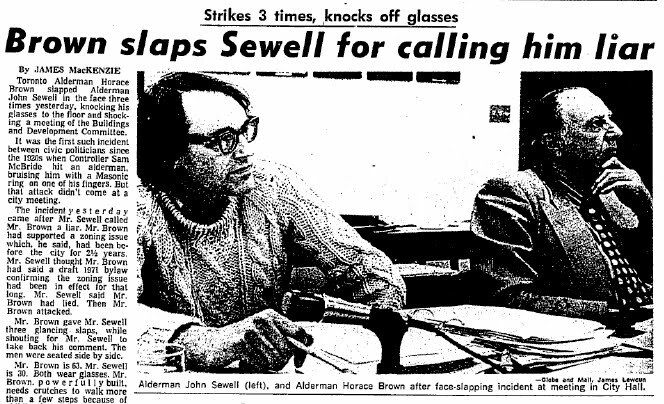 Update: I'm informed by bowdler, who has seen Brown's papers in Montreal, that "Murder à la Carte became The Penthouse Killings." Barring a bit of rewrite, the original title makes no sense. The most one can say is that in The Penthouse Killings the missing body of Fritzi Hahn is eventually discovered hanging from meat hook in a freezer. A reedy link with restaurants, but I've got nothing more. 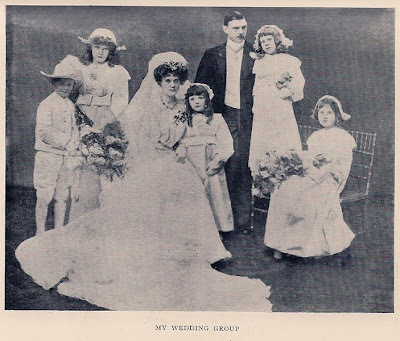 Bibliographer M. Clark Chambers lists Relations and Complications as Kay Boyle's first book. Although I take exception, we would at the very least agree that it is not the work of the Dayang Muda of Sarawak. Née Gladys Milton Palmer, of the Huntley & Palmer biscuit empire, Her Highness led the most extraordinary life. 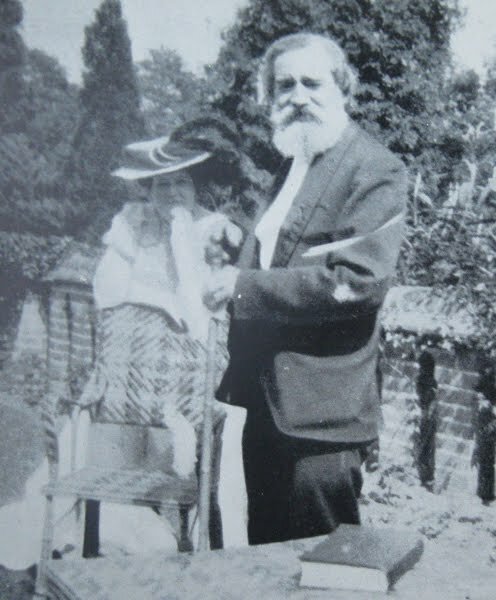 Oscar Wilde, Alphonse Daudet and John Ruskin dined at her family's table, as did her godfather George Meredith. George Meredith with the Dayang Muda's mother, undated. A woman of amazonian beauty, in 1904 she married Bertram Brooke, whose grandfather, having wrestled approximately 125,000 square kilometres of Borneo from the Sultan of Brunei, was the first White Rajah of Sarawak. It's not at all difficult to see what encouraged publisher John Lane to draw up a contract for the Dayang Muda's biography. 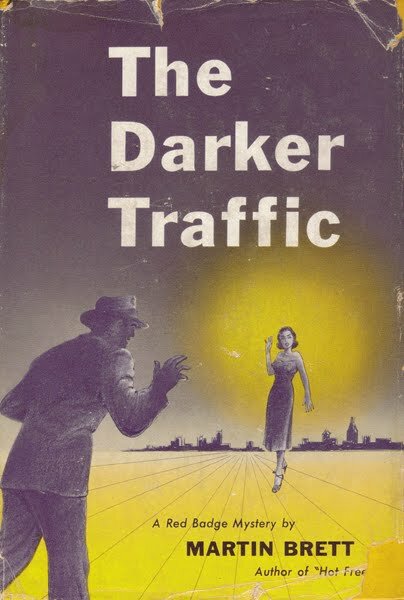 Unforeseen was the sad fact the lady was anything but a memoirist. As Boyle describes it, “her valiant attempts to relive the memories of all she had been, or had not been, served no purpose except to stun her into silence.” And so, the Dayang Muda hired Boyle as a ghostwriter. The new script of the memoirs was beautiful, for Sudge typed well and got the manuscript up with professional competence. 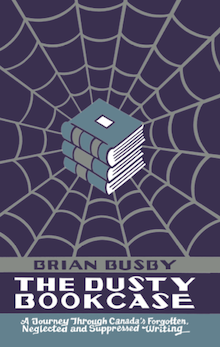 Later, when the book appeared it had a slight success, but anybody knowing the Princess knew that all the dainty wit and bright malice in the book were Sudge’s. Dale had furnished Irish gaiety and wit here and there, but she admitted that Sudge slipped in the best cracks. He had a talent for drawing old dames and gents with cruel caricature, and while his contributions to the book were trivial, the memoirs were so trivial that Sudge’s contribution took on profundity. 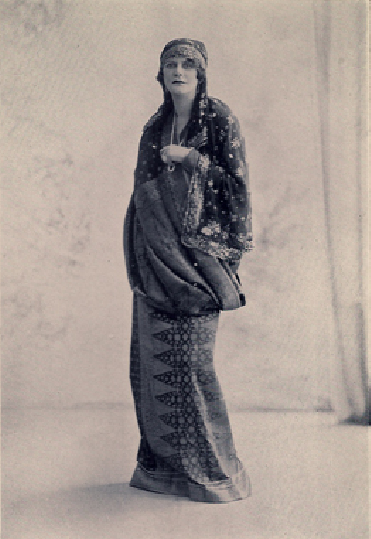 Late in life, Boyle wrote Chambers that of the seventeen chapters, she had had nothing to do with the final two, believing that these had been written by Glassco and forgotten poet Archibald Craig, the Dayang Muda's cousin. 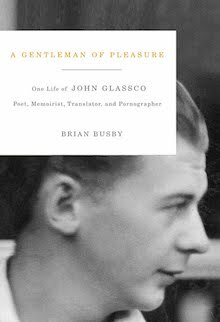 In his own Memoirs of Montparnasse, Glassco claims to have been nothing more than the typist. Typical of a man given to humility and self-abasement; typical also of one who took delight in literary subterfuge. 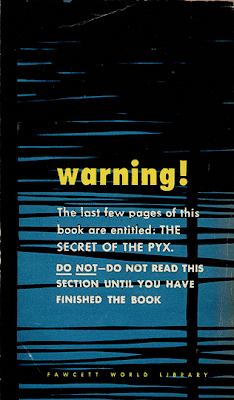 Object: A fairly thick book consisting of 271 pages and 29 plates, ending anti-climactically with a further six pages of advertisements for other John Lane titles. My copy seems to have suffered from a horrible skin condition (now in abeyance). Access: Uncommon. Worldcat lists only seven libraries that hold copies – all in the United Kingdom and the Netherlands. Canadians and Malaysians are out of luck. Only two copies are currently listed for sale online. Though damaged, the cheaper is priced fairly at €275. Those with even deeper pockets will want to consider the more expensive volume. 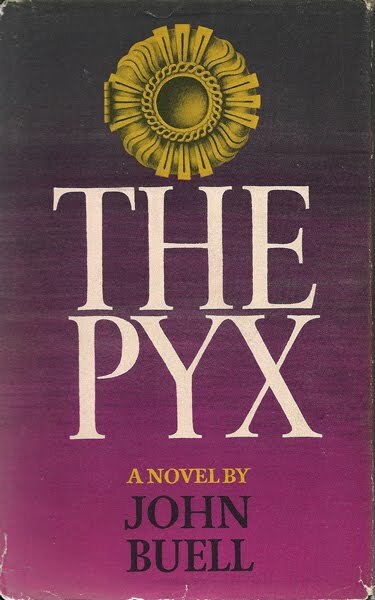 Offered by a Maryland bookseller at US$750, it features Boyle's signature and telling comment: "This was the hardest writing I have ever done." A man with pockets full of lint, for years I kept an eye out for an affordable copy. In all that time, I spotted not one in a dust jacket (which I'm beginning to believe did not exist). I bought my copy for US$85 from a California bookseller in the long, hot summer of 2004. 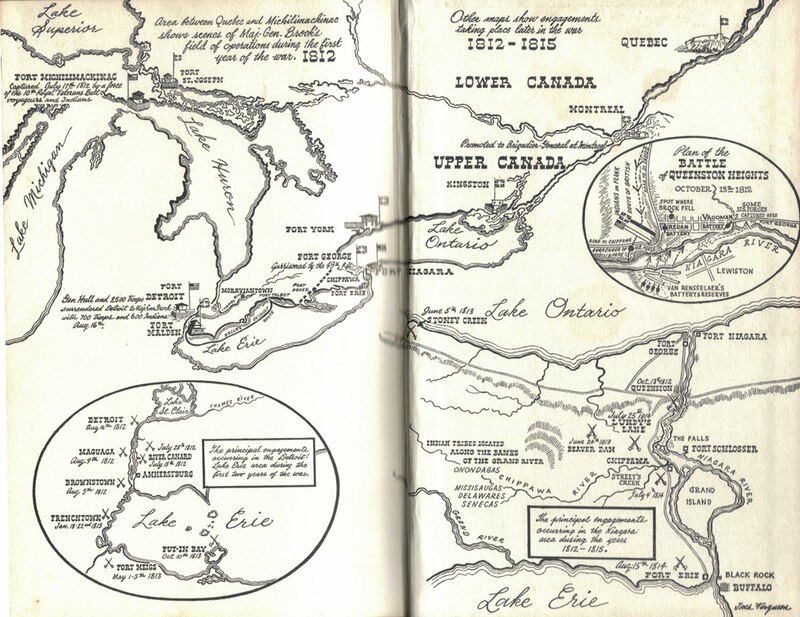 With just over a year until the War of 1812 bicentiennial, things are becoming busy in my part of the country. Our cousins immediately to the south are perhaps a just bit less active. What some American historians call "The Forgotten War" is a conflict David Paterson didn't want recognized. In 2009, the then-governor of New York, the central state in the struggle, vetoed the creation of a War of 1812 200th Anniversary Commemoration Commission. 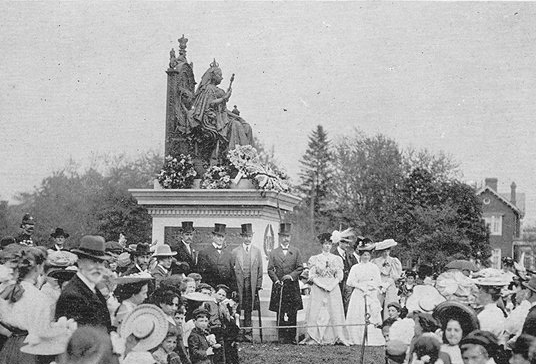 Paterson now gone, the body was finally brought into being through a bill passed the month before last. No finances attached. The commemoration of what was in essence a failed war of conquest should be interesting. I'll be paying particular attention to the treatments of Tecumseh and Isaac Brock in relation to, say, William Henry Harrison. There is no Tecumseh Street in our little town, but Brock has been so honoured. It's not at all surprising. 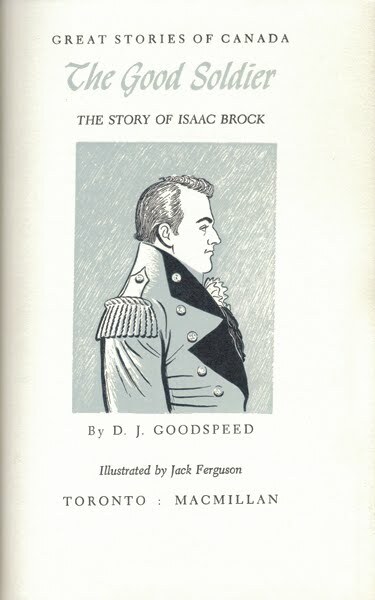 "If it had not been for Isaac Brock," writes author Goodspeed, "Jefferson's prediction that the conquest of Canada would be 'a mere matter of marching' might well have come true." 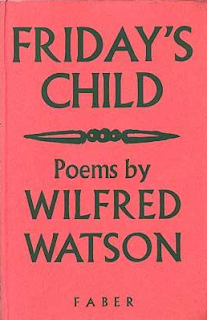 Published more than fifteen decades after the man's death, written for the children that followed another war, this book provides an excellent introduction for anyone coming to Brock's life for the first time. 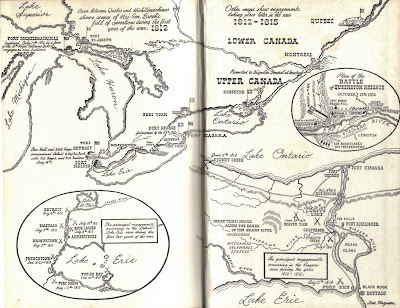 Donald James Goodspeed, a lieutenant-colonel in the Canadian Armed Forces, Senior Historian in the Canadian Defence Force's Historical section, had a talent for writing clean, clear and concise histories. His book on the Canadian Corps, The Road Past Vimy, covers the rather complicated story in just 185 pages. The Good Soldier is even shorter – 156 pages, punctuated by twenty line drawings – yet it provides not only a remarkably thorough account of Brock's life, but some good background on the causes of the conflict. 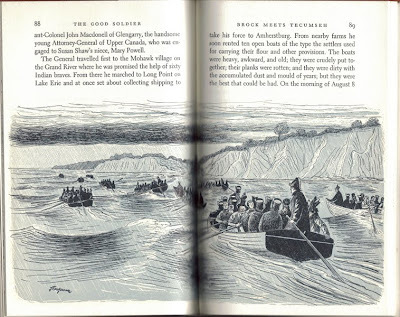 Volume #29 in the Great Stories of Canada series, The Good Soldier follows a strict format in that it features no references. 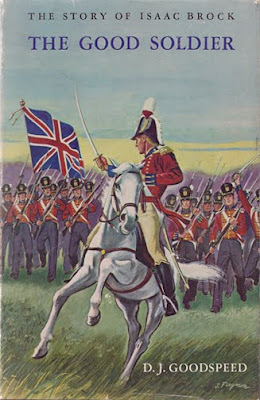 Yet, it is possible to identify at least some of Goodspeed's sources: A Veteran of 1812, Mary Agnes FitzGibbon's 1894 life of John FitzGibbon; and The Life and Correspondence of Major-General Sir Isaac Brock, KB (1845) by Brock's nephew and correspondent, historian Ferdinand Brock Tupper. Goodspeed limits all comment and opinion to the very last paragraphs. It's here that the lieutenant-colonel mentions Jefferson's prediction, adding: "Thus, in a very real sense, Canada's present independence is the gift of the soldier from Guernsey." I wonder what that Channel Island has planned. Trivia: D.J. Goodspeed is my club name. 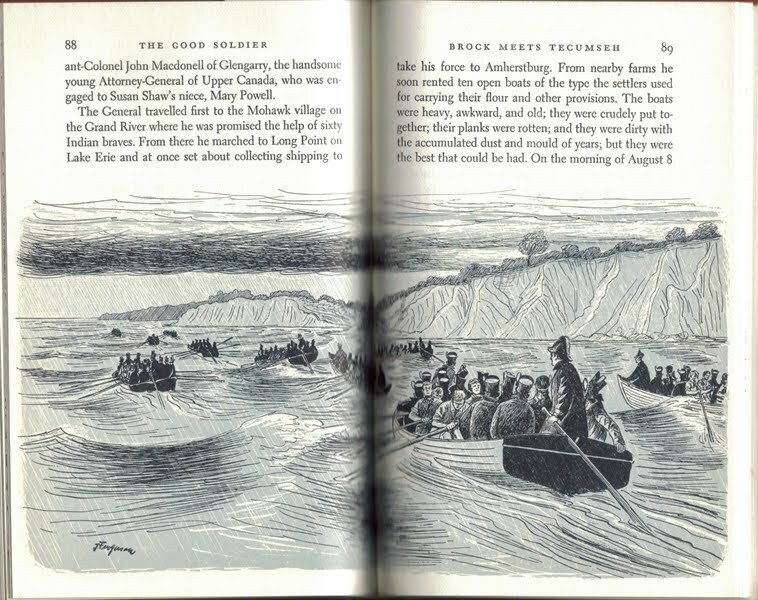 Object: A slim hardcover in black and red boards, with drawings by sometime Great Stories of Canada illustrator Jack Ferguson (who, the dust jacket tells us, lives on a farm that once served as a campsite for Brock). My copy of The Good Soldier, a reprint of the 1964 Macmillan first, appears to have been issued at the same time as a paper edition. Access: A couple of acceptable copies of the first edition are available from online booksellers at about $26. As one might expect, the reissue is cheaper. Brock University has a copy, as do a number of other academic institutions. Only two public libraries hold the book in their collections – both, sadly, as non-circulating reference copies. In other words, children cannot take this book home to read. 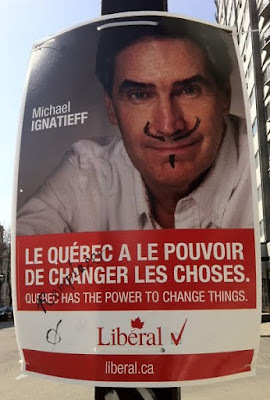 Election day in Canada. Unless the pollsters are way off, it looks like we'll be passing on the opportunity to have a Booker Prize nominee as prime minister... for now. Yann Martel, perhaps. It's been pretty interesting having a critically acclaimed, award-winning author as Leader of Her Majesty's Loyal Opposition, in part because his writing was so often used against him. 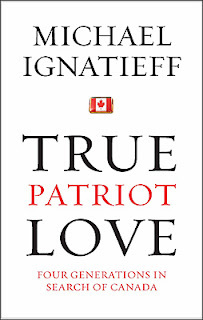 Ezra Levant, for example, thumbed repeatedly through the Liberal leader's 1987 book, The Russian Album, in search of Ignatieff family riches and misdeeds. Time and again, the columnist told us how Ignatieff's great-grandfather, Nicholas, persecuted Jews in nineteenth-century Russia. From where did Mr Levant acquire this information? Why from The Russian Album, of course. And who shares in Mr Levant's condemnation of Nicholas Ignatieff? Great-grandson Michael. 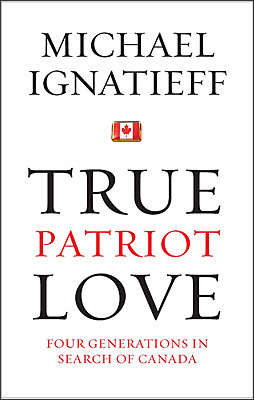 The Liberal leader claims on the inside of the front cover of his book [True Patriot Love] that the National Post, when reviewing his book, called it “well-written”. But that is not entirely true. 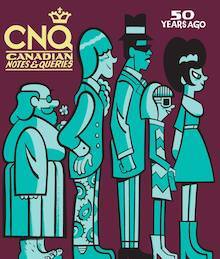 What the National Post called it was “a well-written disappointment." This is the type of dishonesty that not even a first-year university student could get away with. A graduate of the unaccredited Peace River Bible Institute, you wouldn't think the MP would know what a first-year university student could get away with – but then, these words, which appear in Hansard under Mr Warkentin's name, aren't his. He was merely reading from a Conservative Party press release. 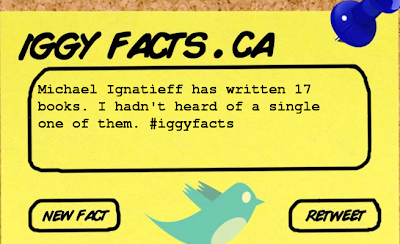 "I'll take the blame from what's between the covers, not for the cover blurbs," Mr Ignatieff responded . We've heard nothing further from Mr Warkentin – you see, the Conservative Party issued no follow-up press release. 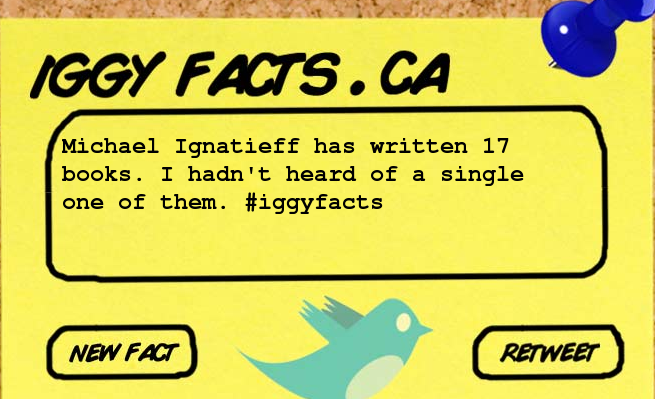 While the monkeys at the keyboards of the Conservative Party have thrown feces at Michael Ignatieff's books, they've ignored titles by the other leaders. There's been no staining of Jack Layton's Homelessness and Speaking Out. Whether the subject is democracy or the environment, they've left the half-dozen books by Elizabeth May alone. Couldn't be bothered? Or is it that they simply "haven't heard of a single one of them"? And Prime Minister Stephen Harper? He remains the only national leader without a book to his credit. His debut, a history of professional hockey's early days, has been long in the making. Five years ago, he published a 700-word teaser. No original research – nothing that isn't out there on the net – but it's a start. When might we expect to see this tome? In April 2006, Mr Harper told the CBC that he'd planned to finish it within the year. In September 2008, during the last election, the PM informed The Globe and Mail that he needed just three months of uninterrupted time. The two prorogations since, it seems, have not helped in moving the long-promised project along. That said, if Mr Harper fails to deliver a Conservative majority government today – in his fourth attempt – that uninterrupted time might come sooner than he would like. 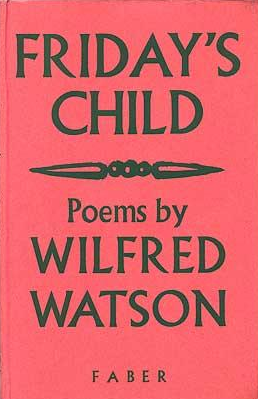 Canadian poet, playwright and professor Wilfred Watson was born one hundred years ago today in Rochester, England. I don't know what sort of celebrations are being planned at his birthplace, but I'm betting we'll see no acknowledgement in this country. The Calgary Herald will not find space in its sports pages. "The award was for poetry."